Western blot analysis of extracts from HeLa and A-431 cells using EGF Receptor (D38B1) XP® Rabbit mAb (HRP Conjugate). 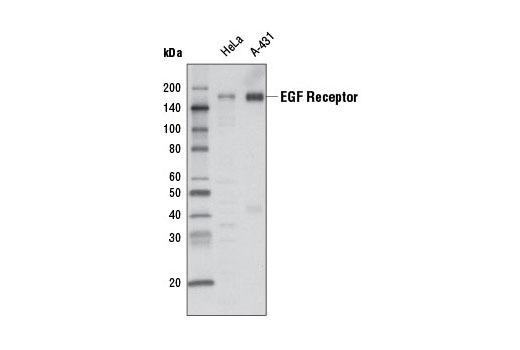 EGF Receptor (D38B1) XP® Rabbit mAb (HRP Conjugate) detects endogenous levels of total EGF receptor protein. The antibody does not cross-react with other proteins of the ErbB family.